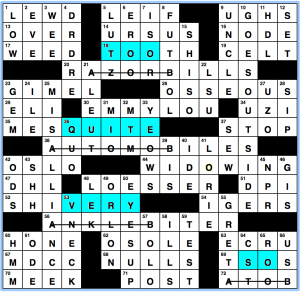 Francis Heaney had last week’s AVCX Meta puzzle, “Well-Connected”. Let’s figure out what was going on with that now that submissions are closed. Simple enough. Connecting the A to B combinations in the grid (of which there are only the four) gives you a grid that looks like what appears to the right of this text. Above each line, you have the words TOO, QUITE, VERY, and SO showing up. 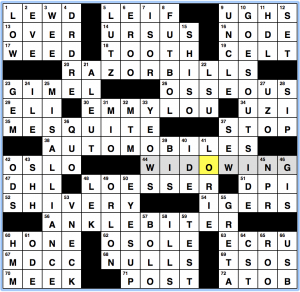 Per the instructions of the puzzle, we’re looking for “a current slang phrase (9,6) that describes someone who’s well-connected, in a sense. I got hung up on trying to figure out something that worked with OVER – after all, we have words that feel like synonyms OVER a line. I should have been thinking ON, since all of these words could have a fifth synonym of EXTREMELY, ON LINE. EXTREMELY ONLINE is definitely a (9,6) phrase used to describe someone who’s in tune with what’s going on across the internet. I would know, since the podcast I co-host titled last Wednesday’s episode “Extremely Online”. I’ve literally been staring it in the face all week and yet it eluded me when I was working this out. Cue lots of UGHS on my part when I realized this was indeed the answer earlier today. I might have overthought this one, but I’m in awe on the construction here. There are a few interesting choices in across fill — URSUS, O SOLE, MDCC — but it’s pretty solid throughout. LEWD, OSSEOUS, LOESSER, GOES OUTSIDE, MISALLIANCE – there was a lot to LEK (sorry, like) here. Hopefully you felt the same way! This entry was posted in Contests and tagged Francis Heaney. Bookmark the permalink. I’ve never heard that phrase before, so there was no way I was going to get this. I saw the TOO/QUITE/VERY/SO above the A-to-B’s but didn’t know what to do next. I thought maybe I was looking for a phrase like _________ REALLY or _________ RATHER (as synonyms of TOO/QUITE/VERY/SO), but I couldn’t find any phrases like that. Never heard the expression, but managed to brute-force my way through this one. After noticing TOO, QUITE, VERY, and SO, I threw those terms into a blender, I mean thesaurus, and looked at the nine-letter words that came out. Found EXTREMELY and then threw that into a blender, I mean Google News search. And that pointed me to the phrase. This was vintage Heaney to me: an pop-culture reference aggressively current and waaaay outside of my wheelhouse, but a theme mechanic so clever I enjoyed it anyway. Never heard the expression, either, but once I saw it was (synonym for very) on line, a little Googling produced the answer. In my opinion, this would have made an even better meta without such a strong hint in the clue for ATOB, but it still was fun. I didn’t even come close. I got hung up on “four visual representations,” counting the lines as one and searching for the other representations in the grid design. My success rate with metas is probably below average, so I’m not surprised this one stumped me. Great construction! And, ultimately, a gettable meta. It just eluded me. I saw the embedded words immediately and sussed “extremely” as a possible first word, but that was as far I got. I attempted Nutrimatic, but nothing looked good for the enumeration “extremely AAAAAA” in the first two pages of hits. Naturally, the phrase appears on page 4 of the results, which corresponds to its seven ghits in Wikipedia (mostly from citations of two articles). That’s barely significant enough to be found by Nutrimatic, which requires a phrase appear in Wikipedia a minimum of 5 times. This feels a little thin to be a thing. I loved the meta, but I’ve never heard of this phrase. Also, all of the high schoolers I teach — along with everyone else I asked — have never heard of it either. Not really sure who uses it. But, like I said, it was fun to solve! Took a looong time to think of “online,” then “extremely” happened quickly. I disagree. This feels WAYYY too thin to be a thing. the people who are not online enough to get the meta should consider that a victory in itself. Add me to the “saw what was going on but never heard of the phrase” crowd. I just plugged in “e???????? o???? ?” into onelook and “extremely online” wasn’t one of the answers. So I had no hope. Um, O.K. An admirably crafty puzzle. So crafty that I still don’t understand what the A to B had to do with it. A red herring just to create lines? I kept looking for an anagram. I guess you have to be extremely online to be familiar with the phrase extremely online, and this puzzle therefore missed a ton of people who certainly otherwise had the meta chops to solve it. For me it was a gimme – the prompt itself basically gave away the answer, and all I had to do was work out how the answer actually fit with what was going on in the meta.